Untitled-13 Can I use it without WordPress? Untitled-16 How do I edit 'Phase 1, 2, 3' text? Untitled-16 Can I customise project status modules? Untitled-16 How to change the fonts in Client Portal? Untitled-13 How do I make a portal public? Untitled-17 I’m not getting Client Portal updates. Untitled-18 Client Portal isn’t working. Untitled-15 I can't find my Client Portal Login page! Financial Are my files safe in Client Portal? Untitled-15 How do I hide Client Portal from search results? Untitled-20 Can I assign a client a different role? 3. Communication How can I assign multiple users to Client Portal? 3. Communication How do I add a new user to Client Portal? If you’re trying to update Client Portal in WordPress but are getting the following error message: “The package could not be installed. No valid plugins were found.” — it’s likely that it’s a license key issue. 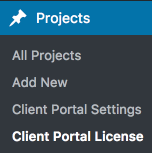 From your WordPress dashboard, simply navigate to Projects -> Client Portal License. Find your unique license key. 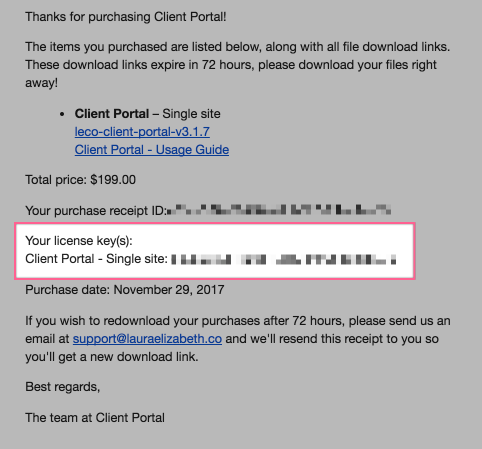 This will be in the purchase email receipt you got when you bought Client Portal (just search ” Client Portal Receipt” in your inbox). Paste your license key into WordPress and click ‘Save Changes’. You should now be able to get Client Portal updates with one-click directly in WordPress! Have a question that's not answered here?